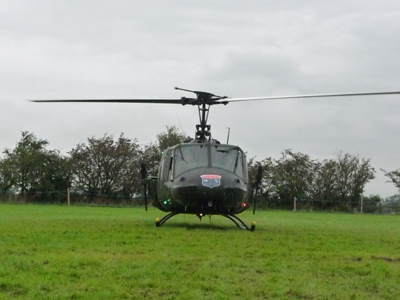 The lastest event for the Huey to go to was in its own back yard so to speak - Rawcliffe Hall at Out Rawcliffe; as the crow flies probably only some six miles. 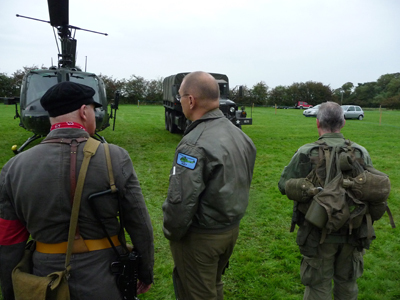 For over ten years there has been a 'Salute to the Forties' weekend which includes a get together of military vehicle owners in the North West of England and a forties style dance in a large marquee. 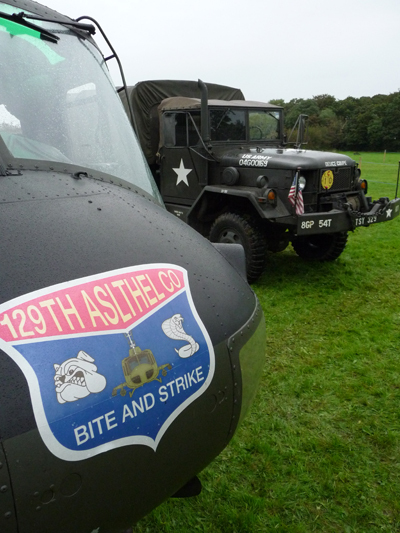 This year was no exception and as we had had a cancellation of a booking down south we were available that weekend to accept the invitation by Paul Higgins of the South Cumbria North Lancashire area of the Military Vehicle Trust for the Huey to put in an appearance. We agreed, weather depending, that we would fly in on the Sunday around 1 p.m. Though not a World War II machine, the Huey's appearance the year before was much enjoyed and appreciated by those there. I suppose with quite a few of the events we attend we're preaching to the converted so will always get an enthusiastic welcome. Sunday lunchtime Phil, Bradley, Mark and I jumped in the jeep and drove up to Out Rawcliffe to recce the site. The field we were to land in was alongside the one we landed in last year. The area the Show took up this year was different for several reasons so it was necessary to check out the new field thoroughly. It was just a short trip through the back country lanes that took us past the home of Bonds Ice Cream and eventually to the toll bridge at Little Ecclestone to take us over the Wyre. Then no more than half a mile and we were driving up the long approach road to the caravan park. Paul was there to meet us and he took us to the area they had set aside for us the land. There were parked cars on our approach route and others a little too close to the landing site so we arranged to get them moved to a safer spot. The caravan that housed the PA system was also moved to a safer distance! Once Phil was happy we set off back to wait and see what the weather was going to do. Up to that point it had been looking extremely iffy to say the least. 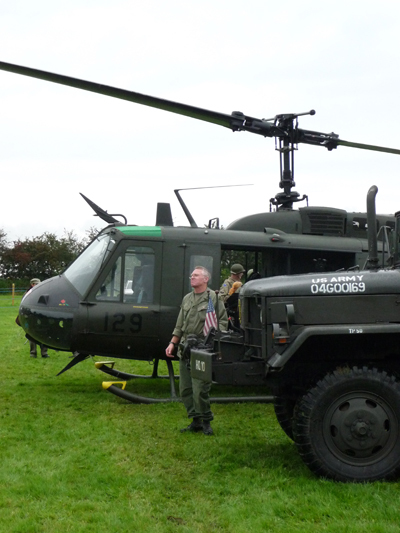 All the time that we were at the Show site people kept coming up asking when the Huey was going to fly in. Paul very patiently explained that it wasn't imminent as the flight crew were at the show checking out the landing site. Once back at base Phil checked again with Blackpool Airport and with the weather details on the net. We had already pulled 509 out on to the strip so that if a break in the weather came we could be up and off as quickly as possible. We had hoped to land around 1 p.m. but we had got up until around 3 p.m. to get in before the battle re-enactment got underway. We all sat having a brew and a chat; somewhat reminiscent of waiting for the off on a mission. There was the four of us along with Jo, Nina and Judith. All of a sudden Phil shouted from his office for us all to get ready to go. He'd been given the green light for a break in the weather and looking out of the window we could see the brighter skies to the south. Bradley along with Nina and Jo jumped into the jeep to head off to Rawlcliffe to be the advance party. Phil was flying; well he'd have to as none of the rest of us present that weekend could have done that for him! Mark and Judith were in the back and I was up front to help Phil. The jeep headed out immediately whilst the rest of crew went out to the Huey. Phil had already pre-flighted Huey so we made sure all our gear was secure and then waited for the phone call to say that the others had arrived and were ready and waiting. The phone call came some fifteen minutes after they had left. I unhooked the blades and Phil went through the final checks before he fired up the turbine. I remained outside the Huey but plugged in to the comms and then made the walk round to check everything was okay before climbing aboard. Phil put his call in to Blackpool Air Traffic as requested and soon we had lifted into the now much clearer sky. We headed north to pick up the Wyre and then track east and before we knew it the caravan park came into sight, but we both had a double take as it looked so different than the previous year. We were much happier we had chosen the correct site when we had clearly identified the field we had checked an hour or so before as we did a circuit just to check the lie of the land and wind direction. Bradley was stood in the middle of the landing zone with his back to the wind to give us the visual reference we were looking for. At just after 2.30 p.m. we touched down much to the delight of those waiting our arrival. As usual we saw a variety of hats, umbrellas, etc getting well and truly blown around by the powerful down draft. 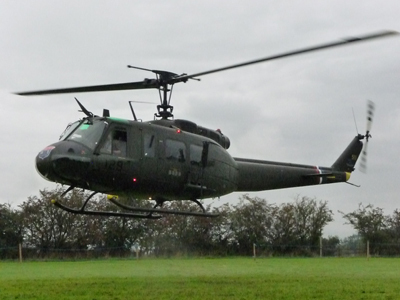 I suppose when you think of it the Huey weighs in at around 4½ tons so to take off and land the rotors have to push down something like 5 tons of air. Once we were shut down and rotors secured all hell broke loose over to our right as the battle re-enactment got underway. That gave us a chance to sort out our bits and pieces which we put on display in the machine. There were people gathering around us whilst we did this with a whole host of questions being asked. Sometimes it was quite difficult to make oneself heard above the sound of the ensuing battle, which seemed to be going in favour of the Allies. Once the battle had finished, with the Hun on the run, an even bigger wave of people arrived to take a closer look at Phil and Jo's pride and joy. 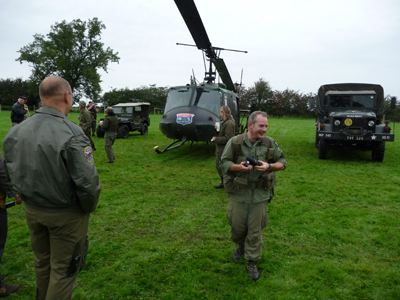 At about the same time a welcome brew and a sausage butty arrived to sustain us through the next couple of hours talking to all those that had come to see us including a friend of mine I hadn't seen since the year before who had come over from Keighley just see the Huey. Thank goodness we were able to fly in that afternoon. The weather once again looked as though it was going to change for the worse so Phil decided it was time to make an exit. Mark, Judith and I moved the crowds back behind the safety barrier whilst Phil, Bradley, Jo and Nina climbed aboard. Crew briefed and strapped in I closed the doors and went to untie the main rotors. I pulled them to the three o'clock position so Phil could see they were reacting to his input movements on the collective and cyclic. 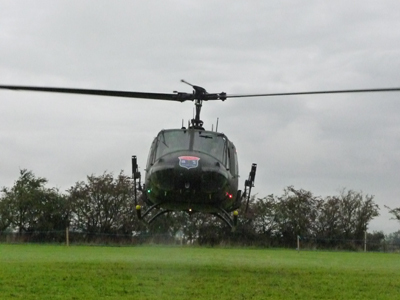 I released them and moved in close to Huey whilst Phil fired up the turbine once again and the rotors began to turn. 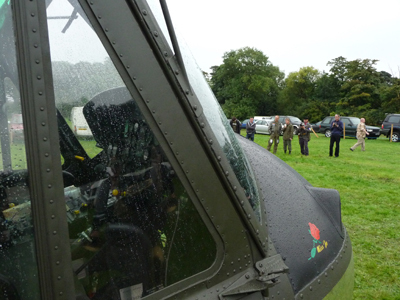 I did the walk round and once happy, with acknowledgement from Phil, I ducked down and moved away from the front of the Huey to clear the rotor disc. I kept a keen eye on everyone around to make sure they weren't encroaching beyond the safety barrier. Video cameras were concentrating on the machine as it was brought up to temperature etc. I gave a running commentary for those immediately around me to explain what was going on, which in itself explained why the Huey doesn't just start up and take off. Phil, having gone through his routine for the start up, was ready to lift. He gave me the thumbs up and I knelt down. ,The sound of the rotors changed pitched as Phil began to raise the collective and the rotors started to bite even harder into the late afternoon air. 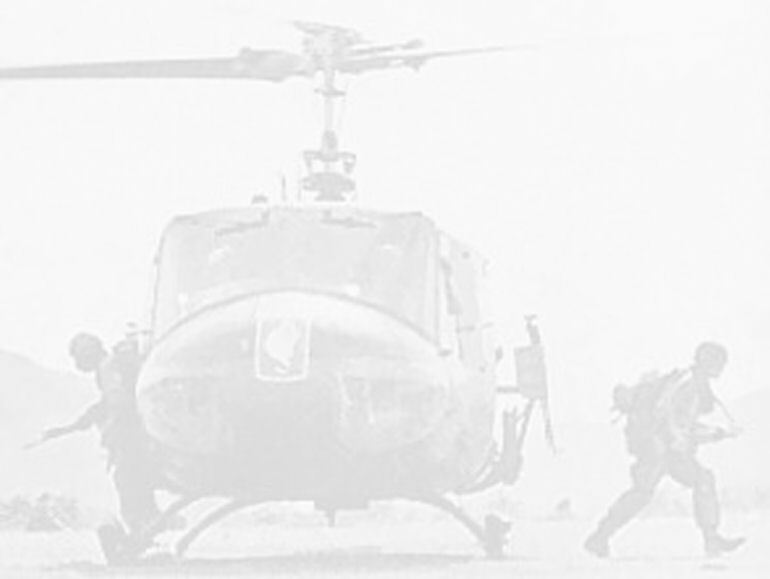 The downdraft got stronger and stronger and those around me soon realised why I'd knelt down as they were beginning to feel the sheer energy of air being displaced by the rotors. 509 broke its contact with the ground and lifted to around ten feet. Phil making his final checks on his input controls before turning the massive helicopter clockwise 180º to fly out the way he had come in. He then climbed quite quickly and turned South. As they cleared the trees they got a view of the weather front heading north, the main thing now was to land at Wesham before the front got there, which they did, but by the time they had shut the Huey down and tied the rotors the leading edge of the weather front was fast approaching. We on the other hand had to put the roof up on the Jeep as we would have got soaked on the way back by road. 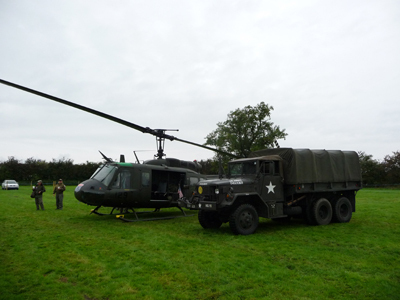 Our departure was delayed as people continued to quiz us about the Huey, but we were also enjoying watching vehicles that had got stuck in the mud being extricated using a 3/4 ton Dodge Weapons Carrier or a 2 1/2 ton Reo, which coincidently used to be Mark's old truck. Our journey back by road took somewhat longer than the Huey and was rather damp, but hey, that's jeep driving for you. 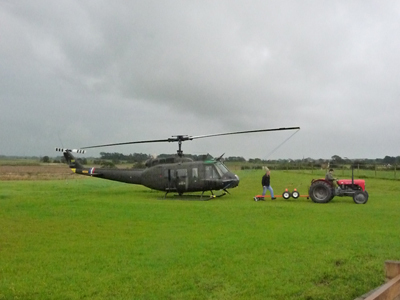 Back at Phil and Jo's we put the jeep into the hangar and we prepped the Huey to bring her indoors as well. Ground wheels attached Bradley fired up the tractor and we eased 509 gently into the dry. All now secure we headed inside for a delicious meal of home made Lancashire hotpot that just finished off in fine style another good day.